What is Feel A Little? Feel A Little began as an online project; researching, discussing and interacting about a different emotion each week to inspire an original poem and illustrated character for children, distributed via social media. This project has grown, and with community support has become the book that is being shared today. 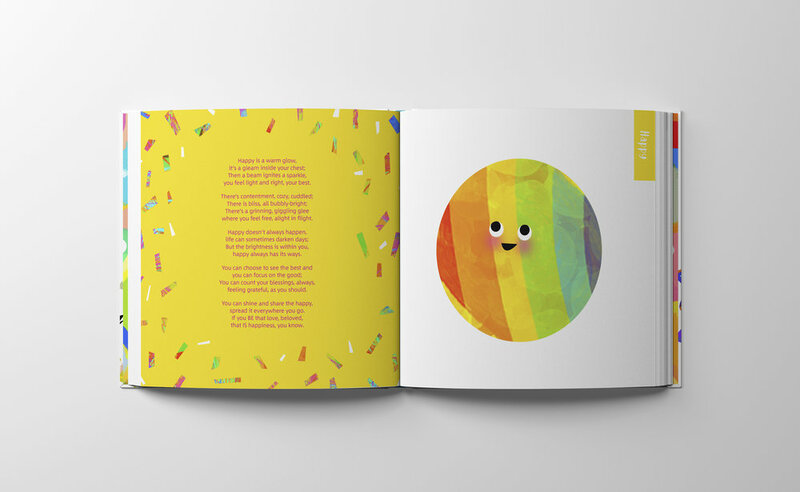 Feel A Little book features a rainbow of 14 important emotions explored through gorgeous ‘read along’ poetry that involves all the senses, accompanied by cute illustrated characters. Rhyme and rhythm help children remember and relate to information, while the bright characters capture their imagination. “We've created Feel A Little to use all those elements to engage kids." says Evie, “It's all very well having important messages about feelings for children, but you have to design something parents and children will actually want to look at! We want to show that books about feelings don't have to be stuffy, preachy or gloomy! They can be beautiful, fresh and spark imagination!" Feel A Little is presented as a vibrant, hardcover book, the perfect format for little hands to hold. Ideal for reading to children from a young age, and for children aged 7 - 11 to read to you, Feel A Little is a book that will last a lifetime. "I love the thought of a child opening up a well-worn Feel A Little Book to the tab with the emotion they feel and just pointing to it. I feel like that would be such a great way to open up when you don't know how to." - Jenny Palmer. After the initial release Feel A Little will be distributed throughout NZ, and later worldwide. Storylines Notable Book Award winner, Jenny Palmer, wrangles A Little Ink poetic illustration, and two darling rascals, Frankie and Boe, with her amazing husband Ben and an aptly-named cat, Dread Pirate Roberts. Jenny’s award winning first book “A Little Abc” was published by Beatnik Publishing in 2015. Evie Kemp is an artist, illustrator and designer. Known mainly for her expressive animal portraits and use of bold colour, Evie also creates graphic pattern designs and has seen her work applied to print, ceramics and textiles. Evie works predominantly with pencil drawing combined with digital techniques, from her home studio in South Auckland where she lives with her husband Sam and various pets. Her first picture book "A Dog Like That!" (Authored by Janene Cooper, published by Duck Creek Press 2010) was a NZ Post Book Awards Picture Book Finalist 2011, won a Storylines Notable Book Award 2011 and was a finalist in the LIANZA Russell Clark Award for illustration. Feel A Little is her third children's book. Please feel free to contact Jenny, Evie or Sophia Egan-Reid from Little Love at the contacts below for more information, or comment.